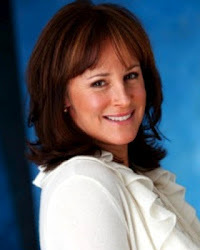 The Willie-Coppee Fund is a joint charitable endeavor between Emmy award-winning actress Hillary B. Smith and her good friend, television writer and multiple-best-selling author Lindsay Harrison, and services clients of the CA-based Sherman Oaks Veterinary Group. 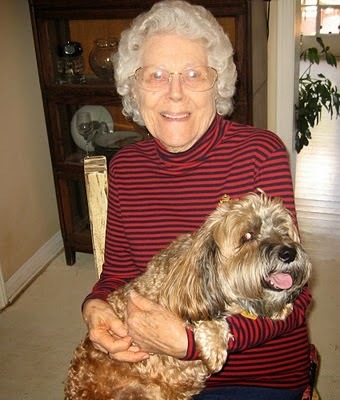 The fund was established in 2007 to honor the memory of their beloved dogs, Willie (Lindsay's Bichon Frise) and Coppee (Hillary's Golden Retriever), and serves to discreetly assist pet owners who may be struggling with overwhelming veterinary bills. Endowments that assist pet owners are incredibly important in today's challenged economy, as countless individuals are unable to provide routine care and medically necessary services for their furry friends. 2) You may also make a donation to us securely via PAYPAL. Just sign into your account and send your contribution to: donate@williecoppeefund.org. Visit Hillary's Official Website to read her heartwarming letter to fans about the Willie-Coppee Fund, if you have not already done so. You are also encouraged to submit photos of your beloved pets if you have donated to the fund, as well as any information you wish to share about them. These contributions will be added to the site as a reminder that even the smallest gesture can make a world of difference in the hearts and minds of fellow pet parents and/or animal lovers. Kindly direct any general inquiries about the Willie-Coppee Fund and all pet photos and related materials to W-C Inquiries at: info@williecoppeefund.org. Thank you for your sincere interest in the project and for your ongoing support of Hillary. Please remember to spread the word to family and friends, soap fans or otherwise. This is a wonderful opportunity for anyone who is an animal lover to lend a helping hand to fellow pet owners in need, especially during these tough economic times. Please know that every penny of donations received will be utilized by the highly-trained staff at Sherman Oaks to provide crucial care for pet owners in need, whether it be for necessary vaccinations or life-saving surgical procedures. No donation is too small, and every dollar is deeply appreciated. Thank you for stopping by, and please visit again soon! Meet Dude, he was a feisty and loving male Lhasa-Terrier mix who was paralyzed from the waist down since he was four. Dude hails from sunny California and was welcomed with open arms by his new family, which includes three furry "siblings" who are sensitive to the fact that he's a special needs animal. Talk about a trouper! Here's Dude on his shiny wheels, made possible in great part by canine rehab master Leslie McMahon of Two Hands Four Paws. Leslie rehabbed Dude for a year after his back was first broken at age four, swimming him, putting him on the treadmill (suspended above it so that he could work his front legs), massaging him, and generally making him comfortable and pain-free with his new body. DUDE DOES "VENICE: THE SERIES!" 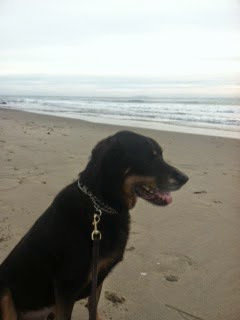 Dude made his big debut in Venice: The Series as "Guya's" (Hillary's) dog, and we are very proud of his appearances. Please visit Venice's official website at venicetheseries.com. The eye surgery was a complete success. Thank you for your Donations! Thanks from Fredo and Osito! 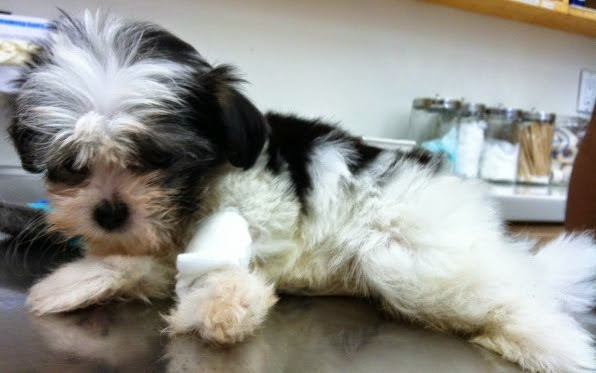 Their distraught owners brought them to Sherman Oaks Vet because they were very sick and ultimately diagnosed with Parvo. Thanks to the Fund, Fredo and Osito received immediate treatment and went home happy and healthy on Wednesday! Their owners are ecstatic and so grateful to all our heroes! 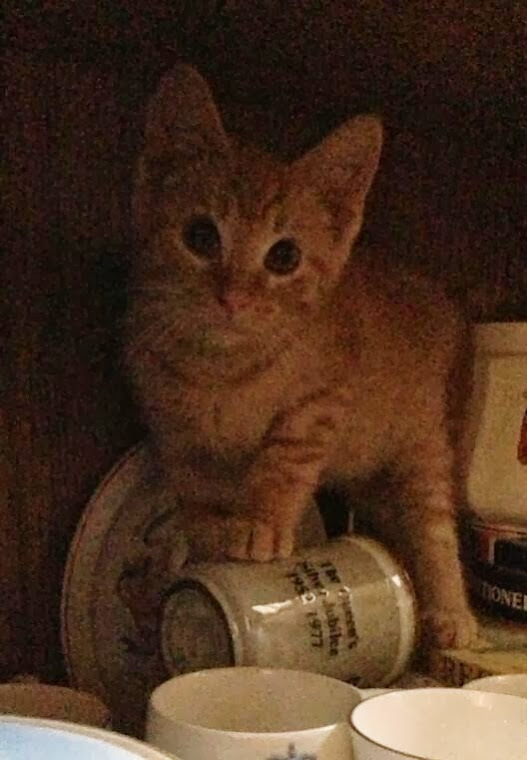 This is Grayson. He's an "outdoor cat" a wonderful woman named Melinda noticed hanging around her apartment building. 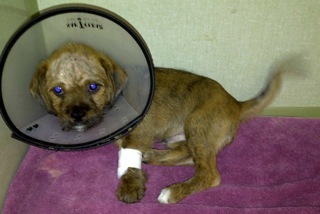 Grayson had a badly injured paw, and Melinda was kind enough to take him to Sherman Oaks Vet. Thanks to all of you, Grayson's paw was treated and has healed beautifully. 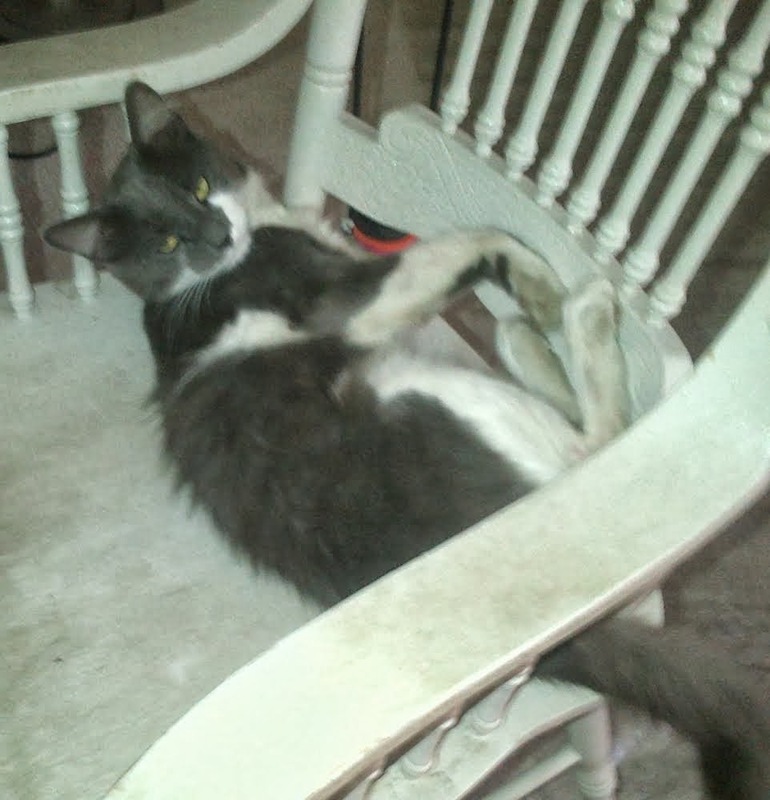 And Grayson, although he's still definitely an "outdoor cat," has a forever home with Melinda, taking full advantage of her cat door and, as you can see, of her favorite rocking chair. God bless all of you for continuing to make these sweet stories possible. Welcome to the family Mozart Rascal Gizzmo Finn! There's a precious baby like this waiting for you right now at your local humane society. A family is here in L.A. from Israel, for their little boy's urgent brain surgery at UCLA. As a surprise for when he came home, they got him a puppy, this precious 8-week-old baby girl named Muffin, who became terribly ill two days after they presented her to their brain surgery survivor. He was DEVASTATED, and they rushed the puppy to Sherman Oaks Vet for treatment despite the fact that they've spent every dime they have on their son's medical bills and their stay in Los Angeles. If it weren't for our incredible Willie-Coppee Fund team, this puppy wouldn't have had the tests she needed, which revealed the diagnosis and the medications needed to cure her. She might easily have died and a little boy who's been through quite enough would have had a broken heart. Instead, Muffin is 80% cured and is going home today to a happy, very grateful family who needs her as much as she needs them. All because of our donors, and God bless every one of them. To the "Angels" who saved "HERO" THANK YOU!!! 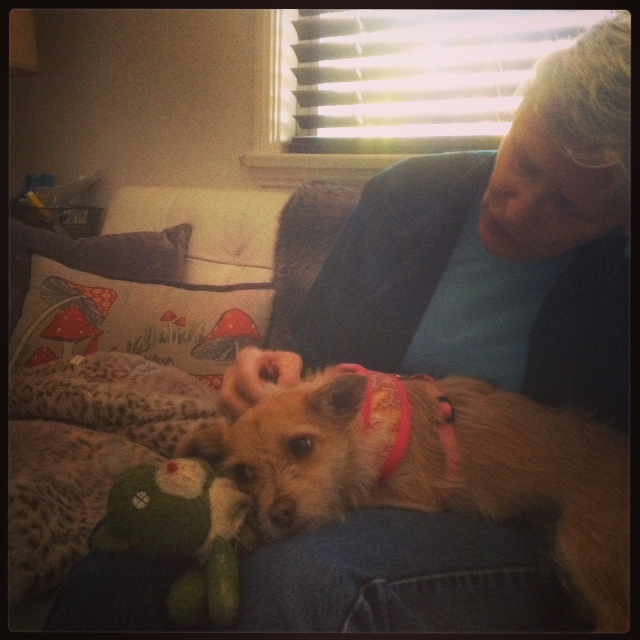 On Saturday, May 25, Rosie was welcomed into her new forever home! 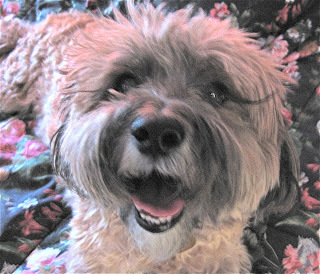 In addition to a mom and a dad and a big back yard, she also has two new sisters - a chihuahua mix and a shih-tzu, who adore her already! Thanks again to every one of you who helped make this possible! Birdie and her new Mommy! Birdie has a forever home! Her new mom, a recently-retired nurse, drove seven hours from Sacramento to meet our girl, and the two of them fell in love at first sight. We'd like to THANK everyone who helped. A STAR named "Lindsay's Dude"
I have named a star for Dude, called Lindsay's Dude. It is in the constellation called Canis Venatici, which represents two dogs, a joy and a star. As are all dogs, as all your babies have been. Love, Dude's Aunt Tory. We'd like to say hello to Cindy and Kate. They have been Volunteering with FUPI for 4 years. You can learn more about FUPI here. Known for her charitable nature, Hillary has dedicated the majority of her career to various fundraising endeavors, and has volunteered her time to supporting network-sponsored events as well as those of her castmates. HILLARY AND W-C MAKE DAYTIME HISTORY!!!!!!!!! We wish to extend our heartfelt gratitude to New York Times best-selling author, Alina Adams, for featuring W-C as part of an interview she compiled with Hillary in her latest book, Soap Opera 451: A Time Capsule of Daytime Drama's Greatest Moments. The publication features interviews with some of daytime's greatest actors and recounts the genre's finest moments throughout the decades! The book is offered in an enhanced format, complete with audio-video clips, and is currently available for download electronically at: Alina Adams Media.Com. CURIOUS TO KNOW WHERE YOUR DONATIONS GO? Meet Julie, one beautiful little feline girl who couldn't resist waving "Hi!" 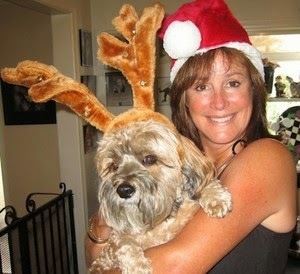 Julie's pet parent (Meagan B. from IL) is a vet tech, and Meagan herself is a huge admirer of Hillary's and the W-C Fund! We couldn't resist sharing this photo with you. It's pretty purrfect, if we do say so ourselves! Here's Dude pictured with one of his favorite ladies, his grandmother and Lindsay's mother, who looks stunning at age 95. Just in case the look on Dude's face didn't give things away, he adores his grandmother immensely...and we think she seems equally fond of him! You just never know where "Tad the Cad" will turn up! 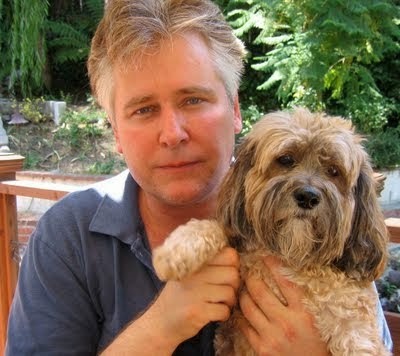 That's right...here's AMC's Michael E. Knight putting in some one-on-one "boy time" with his favorite furry friend. Michael is an avid animal lover, as well as a supporter of W-C.
No, your eyes aren't deceiving you...that is, in fact, the fabulous Nancy Lee Grahn (Alexis Davis) posing with Dude. Nancy--who is well-known for her charitable nature among fans--recently took some time out of her very busy schedule to spend several hours with Lindsay and Dude. We are deeply grateful to Nancy for her commitment to help us raise awareness about special needs animals and the W-C Fund! How can anyone resist those eyes? That face? 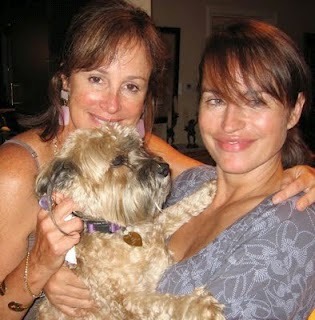 Here's Dude cuddling up with two of his favorite female admirers, Hillary and pal Crystal Chappell. What a "ladies man"!! The odds are good that Dude is trying to land himself a role in Crystal's upcoming new web series "Venice," after he discovered that Hillary joined the cast. 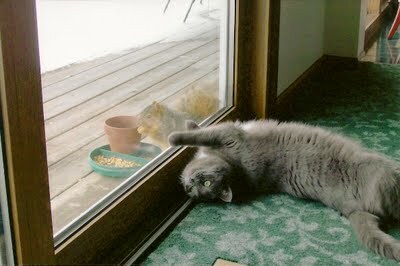 He sure knows how to take advantage of a situation...and for the record, no one seems to mind! Crystal and Dude just can't seem to get enough of one another!! Could it be that Dude really is trying to negotiate a role in "Venice" for himself? Stay tuned to see whether he was successful! 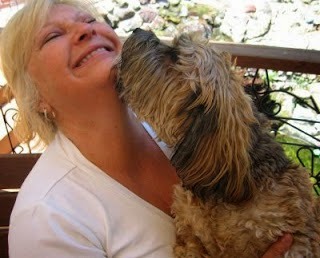 Here's our boy, making himself right at home in the wise and loving arms of world-renowned psychic and #1 New York Times best-selling author Sylvia Browne. Was Dude seeking spiritual guidance or simply a warm lap and affectionate hugs? Only Sylvia knows for sure...and she isn't telling! The rumors are true. Beth Maitland, Y&R's Emmy-winning Traci Abbott, was caught in the act today in a private, secluded hideaway with a "Dude" who's most definitely not her husband Christopher! Far be it from us to judge, but isn't that Catherine Hickland in an adoring embrace with Dude? The same Dude who was seen just days ago in an equally compromising pose with Beth Maitland? At least Catherine is single, but we're sorry...these two women are friends! We can only hope they don't know about each other and that this isn't becoming a trend. 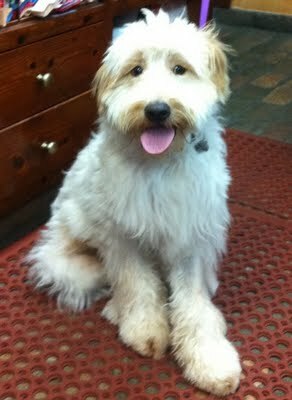 Objectively speaking, Dude is starting to look like... well, we'll say it: a DOG! 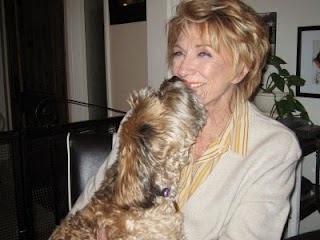 Dude's at it again, this time with Y&R legend Jeanne Cooper and Tricia Cast. These women must work as a team!!! 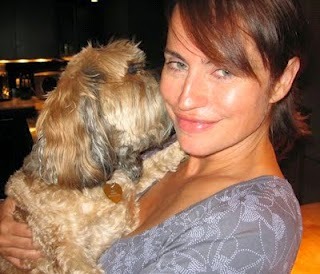 Just in case you had any doubts that Jeanne herself is a dog lover, put those to rest. 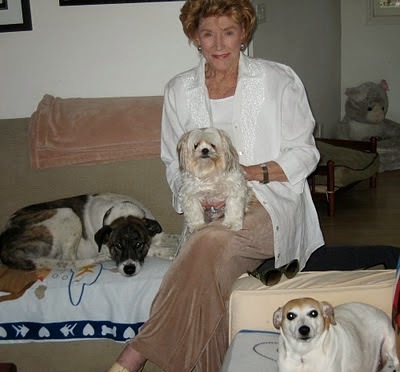 Here's Jeanne, pictured with her three rescues: Bishop, Crackerjack, and Daisy. 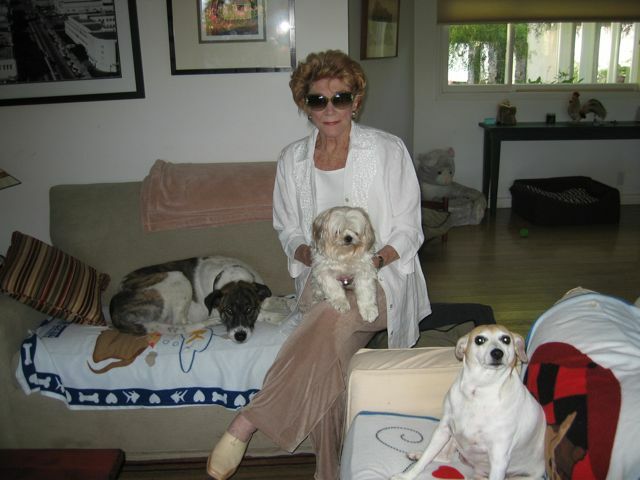 Not to be outdone by her onscreen mother, Y&R powerhouse Jess Walton strikes a beautiful pose with her three adorable rescues, Jake, Rita Hayworth, and Lola. 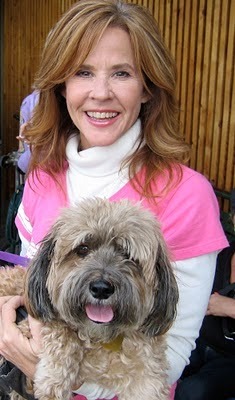 Here's our boy posing with the lovely actress, producer and animal rights activist, Linda Blair, after they spent some quality time together at a recent Easter Egg Hunt for furry friends in Studio City! Here's actor Joel Brooks, most easily recognized from "My Sister Sam" and more recently from "Six Feet Under." 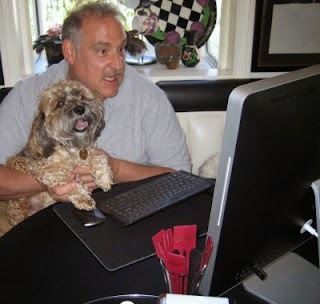 Joel took time out of his busy schedule to show Dude the website for Auditions LA, the online auditioning course he and Beth Maitland have created. Needless to say, Dude was very impressed! Who says you can't show an old dog new tricks?! Here's Dude with actor Jeffrey Jones, famous for his standout roles in "Ferris Bueller's Day Off," "Amadeus," "Deadwood," and "Beetlejuice", just to name a few. Is our boy seeking acting tips...or simply seeking some affection?! In either case, he and Jeffrey have become fast friends, and we hear that Dude is even referring to his new friend as "Uncle Jeffrey" these days!! Dude isn't all about the ladies!! Here's our boy, in search of serious affection from ATWT veteran, Scott Bryce. Watch out, ladies---you may need to compete for Dude's attention with the men in his life before long! Where is the famous face in this photo, you ask? Now that Dude is on his own path to stardom, he insisted on being photographed in his own right! Here's our little superstar, pictured with his siblings, Bette, Sophie & George. 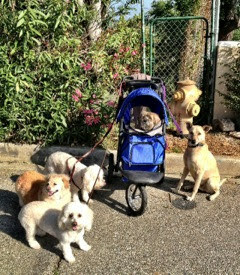 And a huge "shout-out" goes to Nadia at The Barking Bunch for doing the honors, as well as for providing the fabulous photo of Dude in his cart (above -- center). 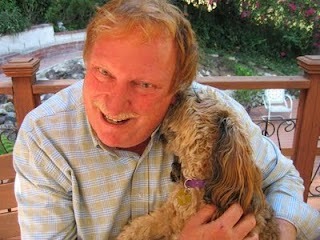 Michael Chill is the owner of Animal Services, a Los Angeles company specializing in dog training and behavior. Over the past 30 years of training, Michael has established an excellent reputation among the top members of the pet industry, including veterinarians, groomers, pet shop owners, and other pet professionals. 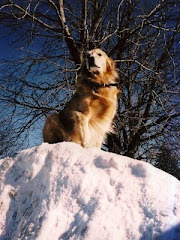 Michael was the dog training instructor at the Animal Trainers Career Academy in the late seventies, and lectured at the School for Animal Care Consultants. 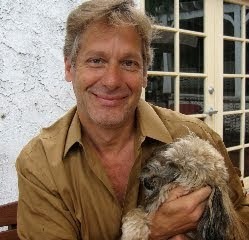 A member of the Dog Writers' Association of America, Michael is the author of Puppybook, and has published many articles on dogs and behavior. 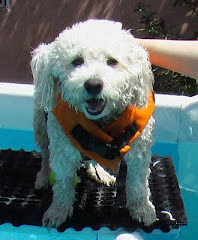 He currently writes a monthly column on dog training and behavior for the Animal Press. Michael is a consultant for many city, state and federal agencies, including the Department of Animal Control, the Los Angeles S.P.C.A., the Santa Monica Animal Shelter, the California Department of Fish and Game, and the U.S. Fish and Wildlife Service. He has appeared on many television shows, including A.M. L.A., Good Morning America, Hour Magazine, and the Home Show. He has been featured in many dog training and pet care videos, including the Pet A Gree Tapes and Rue McClanahan's Pet Care Guide. Ed and Leslie Grinnell founded Eddie's Wheels and have been living with dogs with disabilities for 20 years. Their own dogs, together with the hundreds of disabled dogs whom they have personally measured and fitted in their carts each year, have been their inspiration. They have taught the Grinnells how to meet the challenges of providing our disabled soul companions with the equipment and the care they need to lead a “dog's life”. Their customer care team, headed by Leslie Grinnell and Carole Groman (a certified animal massage therapist), is dedicated to providing each caregiver with the emotional support, product information and assistance they need to be successful in caring for their pet. They are happy to work with pet owners and their vets or animal rehab practitioners to incorporate a mobility cart into the pet's care plan and their lifestyle. And yes, they build carts for cats, goats, bunnies, alpacas..... any four-legged friend in need! 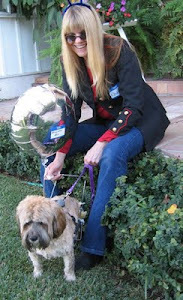 Linda Blair Worldheart Foundation (LBWF) is a non- profit, 501c3 tax deductible organization dedicated to rescuing and rehabilitating abused, neglected, and abandoned animals from the harsh streets of the Los Angeles area, as well as from the overcrowded and overwhelmed city and county animal shelters. The foundation consists of Linda Blair, award-winning actress, humanitarian, and recipient of the coveted Los Angeles Proclamation, dedicated friends, supporters, and many wonderful volunteers. As a child, Ms. Blair was taught to respect all animal life, and had aspirations of becoming a veterinarian. As an adult and public figure, she has chosen to shed light on the crisis in America that we call animal cruelty. LBWF is a unique safe haven for animals providing top-quality, life long care to the animals it rescues. The emphasis is on proper nutrition, first class medical care, comfortable facilities, training, socializing, and of course, an abundance of love. We ensure that every animal has a second chance at life, as well as a forever, loving home. Awarded "Small Business of the Year for 2009" by the United Chambers of Commerce, Rusty's Discount Pet Center has been serving pets and their owners of the San Fernando Valley and its surrounding area since 1987. The center strives to provide a fun, exciting, and safe environment for people to bring their pets for services/supplies which are vital to their pets' wellness and happiness. Rusty's has been dedicated to the well-being of all animals since its inception, and provides pet owners peace of mind that their loving pets are in capable hands. 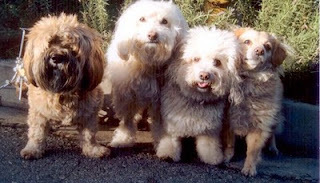 Throughout the years, Rusty's has helped find loving homes for thousands of abandoned, lost, or abused animals by working with many rescue organizations in the Los Angeles area and beyond. Every member of its staff shares a mutual love for animals, and is dedicated to executing the mission that drives Rusty's forward. Sherman Oaks Veterinary Group is a full service facility, providing loving pet owners with complimentary traditional and alternative veterinary care in order to maximize wellness. Some of these services include: dermatology, dental health, pediatric/geriatric care, preventive health (including behavioral/nutritional counseling), general and orthopedic surgery, and specialized ophthalmologic and cardiology care. In addition to providing a full spectrum of preventive care and routine maintenance, Sherman Oaks offers alternative therapies and cutting edge diagnostic services. The expert staff at Sherman Oaks provided acupuncture/chiropractic services for Willie's arthritis, and worked alongside Leslie McMahon at Two Hands Four Paws in order to improve his mobility and flexibility. Sherman Oaks Veterinary Group provided top notch care throughout the last six months of Willie's life, and Willie spent his final moments in the loving and compassionate hands of those at Sherman Oaks. Founded by Nadia Brunner and based in Los Angeles, The Barking Bunch is an all-inclusive canine care business that provides professional training, exercise and boarding services. Nadia's inspiration to help others with their dog's behavioral issues stems from rescuing and owning a willful and loving Doberman Pincher mix, and she has since worked privately with dog owners in the Los Angeles area, guiding them in harmonious existence with their animals. 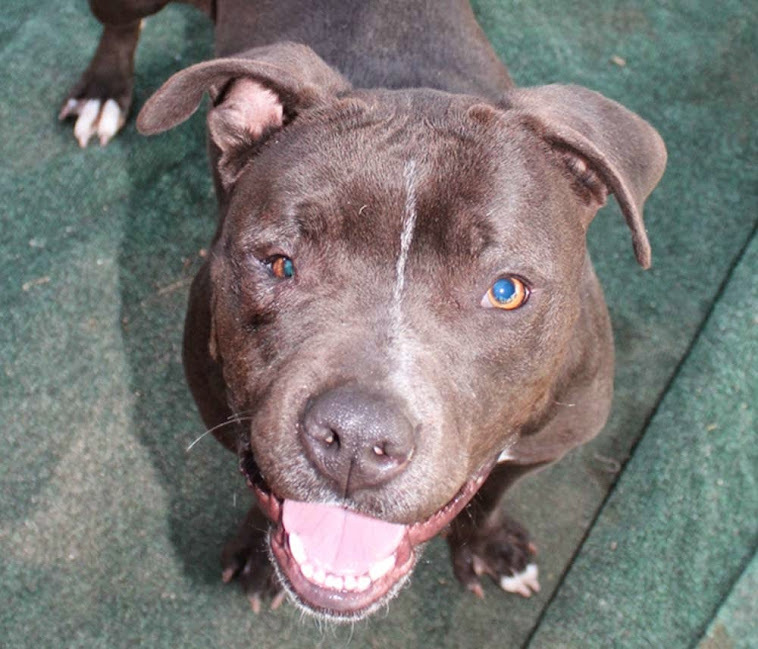 Nadia has also worked with many rescue organizations in rehabilitating dogs whose behavior is seemingly hopeless and has succeeded in transforming them into adoptable loving family pets. She is a Certified Pet Dog Trainer educated with the Animal Behavior College (ABCPT) and also a member of the Association for Pet Dog Trainers (APDT). Please visit Nadia's website for further details and for specific information on the services she provides, including her upcoming puppy and dog training classes. Group classes run for 5 weeks and meet once per week on Saturdays for 90 minutes in North Hollywood Park, 10am - 11:30am. 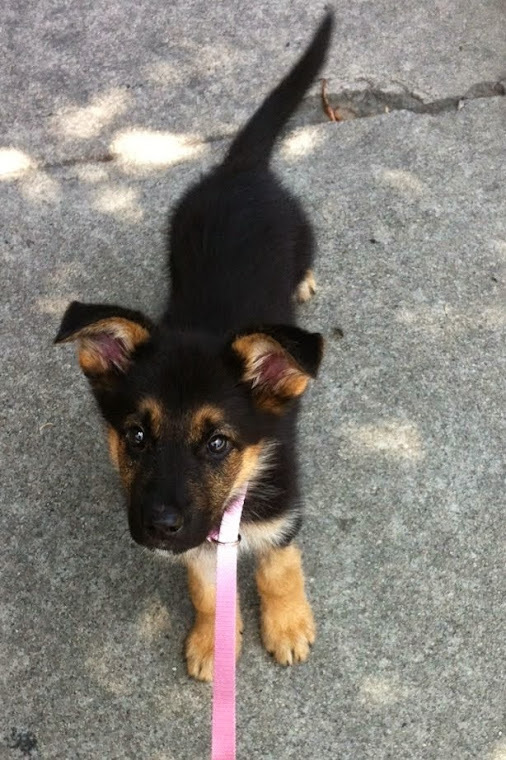 The cost of the 5-week basic obedience program is $125.00. Please visit Nadia's website for full details. Founded in 2003 by canine rehab master Leslie McMahon, Two Hands Four Paws is the oldest wellness center for canines in the Los Angeles area. Not only is Leslie responsible for rehabbing Dude and improving Willie's quality of life as mentioned above, but her expertise and dedication extends to assisting dogs which may be facing a myriad of challenges, including stroke and paralysis victims, and those which are enduring health obstacles due to weight. 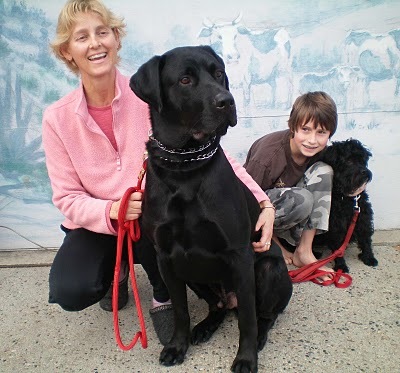 Please visit Leslie's website to read her fascinating bio, peruse animal recovery success stories, and to obtain helpful links and other resources designed for pet owners and animal lovers alike. Also provided on the site is an appointment schedule for prospective clients, a monthly "Webletter" with updates and interesting tidbits, as well as television/radio feeds of some of Leslie's most noteworthy appearances. All submitted materials are property of the Willie-Coppee Fund. No portion of this website may be reproduced or reprinted without expressed consent of its Webmaster . All requests for reciprocally linking the Willie-Coppee Fund should be directed to the Webmaster. The Willie-Coppee Fund reserves the right to reject any such request due to incompatible site content. This includes sites which may provide links to other venues whose mission or goals are not consistent with those of the Willie-Coppee Fund.